Designed for small pets. Locks securely on top and bottom with no damage to walls. The gate also features a pull handle with door. 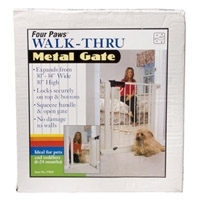 Four Paws Double Wide Walk Over Wood Gate 18X48-80"
Four Paws is very excited to introduce a variation of our best selling gate. 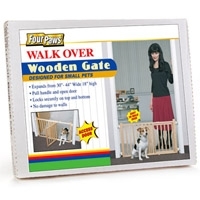 Four Paws Double-Wide 18” High Walk-Over Wooden Gate is expandable up to 80”-that’s over 6 and a half feet wide! At 18” high it will keep small dogs and older dogs that have lost their “vertical leap!” ability at bay without becoming an obstacle to family and friends. Assembles easy with no damage to walls. 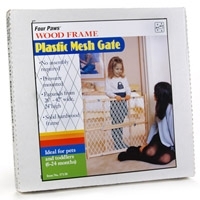 This safety gate is made with a durable solid hardwood frame. No assembly is required for this pressure mounted gate. 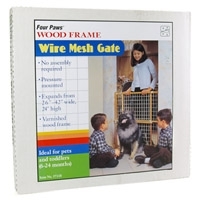 Four Paws now offers our best selling Wood Frame Wire Mesh Gates with a gorgeous, darkened, wooden finish. The beautifully finished gates are strong and durable; the wire mesh is powder-coated to inhibit rust. No assembly is required for these pressure mounted gates, thus no damage to walls. Available in two sizes. 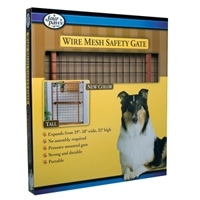 Four Paws offers three sizes of wire mesh gates to cater to the needs of pet homeowners. These gates are extremely convenient since they are pressure mounted and no assembly is required. These gates also feature a varnished wood frame. 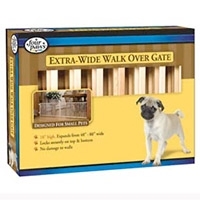 This popular gate is available in three sizes. 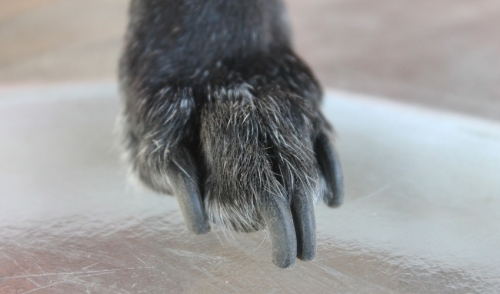 The handle is designed to be gripped and squeezed from the bottom so that dogs cannot place their paws on the handle and inadvertently open the gate. These gates can be opened to walk through either direction. Gates are conveniently pressure mounted so there is no damage to walls.